Morning! Haha, had a late night last night and just woke up a few minutes ago which makes me feel like a teenager again so I'm automatically in a good mood despite my headache and hangover. Before I go on, just want to say Congratulations to my dear friend Mike who just had a very succesful grand opening of his new bar last night. In case you happen to be in the Timog area, check out the "Underground Bar". It's a small cozy place with live music and cheap drinks. Moving on...I can be such an Imelda Marcos that I think it's only fitting for me to raffle some tickets off for the biggest shoe event of the year. 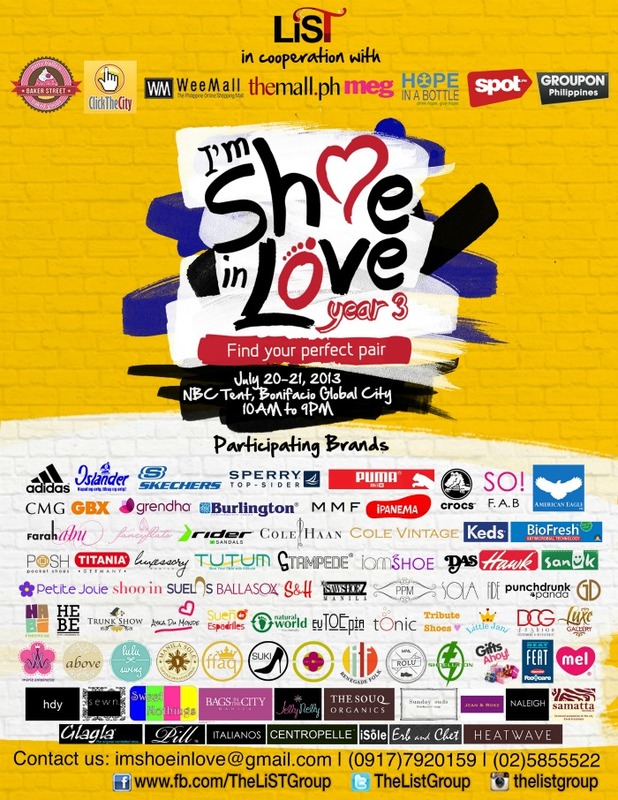 Yup, it's time for the I'm Shoe In Love bazaar again where you get to shop your fave brands like CMG, So Fab, Keds, Adidas, Sperry, Grendha, Ipanema, Crocs, Sanuk, Cole Vintage, Suelas, etc, etc for a fraction of their original price! I was given 10 tickets to raffle off but I decided to just award it to 5 readers so you can take along your friend/husband with you since it's not much fun to shop alone, right? Leave a comment with name, email and tweet url in this post. That's it, will announce winners on July 18, 2013.